Jennifer Cluff: Can you buy a good quality pink flute? Can you buy a good quality pink flute? I am interested in purchasing a good quality flute that will last me a long time, however, I would also like it to be pink. The pink flutes I am finding on the internet so far seem to be lower quality. Do you know of a place I can get a high qualilty pink flute, or is there a way I can have a regular silver flute lacquered to that colour? I'm sorry to bother you with such a silly question, but I am very interested in this, and the internet has not been very helpful thus-far! Thanks for your time. As a flute teacher and performer who has played for 35 years, I firmly believe that playing the flute is about the SOUND of the flute, and the quality of its workmanship, so that it lasts and works well. What the flute looks like is way down on my list. The idea of colouring or laquering a flute for aesthetic purposes is the opposite of almost everything I know about the instrument. They keys have to be fast, the pads have to seal, and the sound has to be beautiful. The companies who do paint flutes in colours use very cheap flutes that have few or none of these qualities. And, as far as I know, to date there is no reputable flute manufacturer who decorates flutes in this manner. However, I wonder if you're asking about a pink flute because you have a young person in your life who loves everything to be pink? If this is the case, you can buy a pink case cover or make a pink flute case cover and/or simply tie a pink bow on the crown of the flute. I recommend these brands of flutes as durable and decent quality. Note: The above post has re-edited to get rid of the sound of frustration that I was being haunted by when first writing this. Thanks to Anon. who pointed that out. I think if someone were truly determined, they might find someone to lacquer a Yamaha 200 student flute in pink. That said, I do agree that perhaps a pink music stand, case cover, music folio, etc are a much, much better idea. Another fun, and still appropriate, option could be having a pink stone set into a custom crownpiece. I do think that showing up with a pink-lacquered flute for any respectable audition or performance would be a serious handicap to the player. Actually this question came up on one of the flute discussion groups recently, and a repair technician suggested that the mechanical tolerances were too close on a flute to be able to laquer anything other than the tube. The lacquer build up was too much for the tone holes, mechanism etc. the laquering I just referred to was post-manufacture, of course. Generally speaking, the color doesn't make any difference. It's the quality of the flute itself. But I agree with Rebecca, a respectable performance might not be appropriate. Although there are some musicians who use flamboyant instruments. One of the Philadelphia Orchestra violinists (i forget his name) uses lots of colors. It works for him, its his shtick. I know a Taiwanese flute maker is making a new flute material called "Grenadiite". They might do Pink Flute. They sold this material to Pearl piccolo. Their piccolo "Pearl PFP 105" is made from Grenadiite. I need to buy a pink flute case cover and it needs to look attractive but i only need to fit in a flute, no piccolo. Where did you find that picture of that pink flute case? Please answer quickly!!!!! 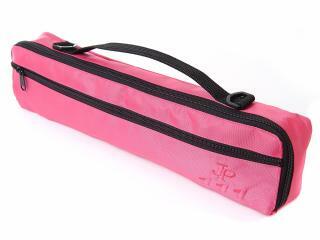 I googled "pink flute case cover". You'll find they are made by John Packer or Trevor James and are sold in British flute specialty shops. Did you google pink case cover flute or any combination of those words? Landell say "We can anodize our titanium heads any colour you like. Rainbows too." Hhahaha; a pink titanium headjoint! Oh wow; that would be great for a 10 year old beginner, hahahahha. I don't know if folk reading this realize that I get asked about once a year to direct them to a pink flute. I can only imagine it's for a "pink lover" young person who must have everything pink. Whereas I used to be a "flute loving" young person, who just wanted a flute that didn't break down after a few weeks of play. Didn't get my own flute until I was 16 years old (used band-flutes from school.) and didn't get one that didn't break down until I was 26! So I'm not so interested in "pink" or the colour. There are real working flutes that are actually flutes made to play music, and then, on the other hand, there are pink ornaments that have symbolic or ornamental value. What you are looking for probably is the latter. You don't need a working flute that plays music; you need a toy flute, or a toy flute ornament, or a pink ornament. This blog is about functioning flutes that people actually play music on everyday and how to learn to play flute. Pink flutes don't really exist in the real playing flute world. However there are many pink ornaments that you can find; figurines, sun-catcher stained glass, pink fabric or ceramic house ornaments; that's likely what you really want; not a $300 spray painted flute from a factory that makes bad flutes cheaply and spray paints them. >>I stumbled across this article and I had to comment. While I completely agree that quality and sound are the most important features in an ideal flute; too often people make the mistake of believing that these can only be obtained in expensive flutes. I have personally had great experiences with the flutes sold at Musicalmart.net. Their prices flutes are cheap but the quality and sound are great. Don't get me wrong, there are flutes that run in the thousands that can out perform the ones at that online store and if you can afford it, go for it. But in many cases cheaper is often better. The problem is that there is no "scientific test" for how long cheap flutes last unde3r heavy use, and how well they can be repaired. If anyone can post a link to such a comparison test, I'd be the first to link to it.